It finally happened: I found another lane-pushing game that I like. The Smite regionals in Cologne are to blame: I went in a novice and came out wanting to give the game a try, and now my lunch breaks are consumed by Arena. This is well-timed, really: 6.82-era Dota 2 doesn’t reliably fit into 45 minutes any more, whereas I can play a couple of games in one of Smite’s lighter modes in that time. I’m still not quite feeling brave enough to head into full 5-on-5 play, but that’s partly because I’m really enjoying the 80% Arena winrate that my transferrable Dota 2 skills (such as they are) have granted me. More to the point, I like the little things that make Smite less of a fraught experience than the game I’m used to: the tactical necessity of retreating to base, the rhythm of pokes and ganks, the way ults operate as much as a ‘make play’ button as a ‘oh god guys we need to teamfight we’re wasting time’ button. I’m sure the game has those elements, but at the moment it feels like a holiday in a more straightforward land. There’s a chance I’d enjoy League of Legends for similar reasons, but I’ll never see the point in committing to a game where your account level dictates anything about your potential power in-game. 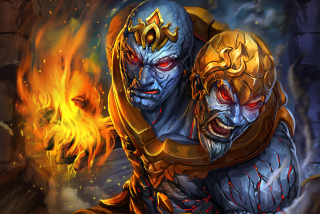 Smite earns a lot of good will by dodging that, and by offering an affordable pack (£20/$30) that allows you to unlock every character, past present and future. I haven’t actually played GAME OF THE YEAR: 420BLAZEIT vs. xxXilluminatiXxx [wow/10 #rekt edition], but I’ve seen enough gameplay footage to know that it’s a work of art. Created by Melbourne developer Andy Sum for the recent Seven Day First-Person Shooter Challenge, watching GOTY is like listening to Lou Reed’s notoriously unlistenable Metal Machine Music LP. It’s a distillation of everything ugly and garish about modern blockbuster gaming: the unmitigated bloodlust, the corporate synergising, the flagrant macho stupidity of it all. While the parodic game is ostensibly ‘funny’, it’s also weirdly disturbing: this is a part of our culture that seems fairly commonplace, until it’s paraded before us in such a concentrated fashion. I recently completed a big, sprawling RPG—one that took up a solid week-and-a-bit of my life. Afterwards, I was in need of something smaller, lighter and altogether more silly. The answer, it seems, was bears. At this point, I think I've played more of Far Cry 4's map editor than I have of Far Cry 4. It's great. More importantly, it's dumb. I'm not sure it's meant to be dumb, but the way I've been using it is. With a few clicks you can set up a ridiculous scenario, and then head into play mode and watch it play out. For the most part, I've been stacking animals. Or blowing up animals. Or blowing up stacked animals. One day, I might make a real map. More likely, I'll try to jump over a pyramid of bears with a tuk-tuk. I suppose it’s uncool to admit that I’m enjoying what’s essentially a clever marketing campaign, but the truth is the Good Ship Cool long since sailed for me, and I’m straight up loving the daily drip feed of cards from Hearthstone’s Goblins vs Gnomes expansion. We got to reveal one ourselves earlier today—Hail, Iron Sensei!—and you can read my ramblings about all the recent cards here. So far easily my favourite is the Druid’s Anodized Robo Cub. Not the flashiest creature in the game by any stretch of the imagination, but a wonderfully flexible early drop for a class that badly lacked exactly that. Also, the art is adorable. And if you’re not choosing at least a couple of cards based on irrational love of the artwork, you’re Hearthstoning wrong. Bears are fine, but goats are where it’s at this week. A new free expansion turns Goat Simulator into a (fake) MMO, where you can quest to pick up apples and infiltrate a sheep village, but mostly just headbutt people into ragdolls. I’m still with Andy on Goat Simulator—it’s silly and all, but I haven’t found much actual entertainment out of it—but this update was too clever not to try. For one thing, you can play as a walking microwave. Just like I always dreamed. It also does a great job of simulating MMO chat convincingly enough that, for a minute, I questioned whether it was fake. Even better, it inspired a very stupid article, so I have it to thank for that. I have bled to death in an abandoned apartment complex. I have died of severe hypothermia in a field. I've been hit in the leg so hard I've crumpled to the ground and been mauled to death by a desperate stranger. You too can experience the panic and misery of the post apocalypse in NEO Scavenger. This low-fi survival game only lets you carry what you could feasibly carry in two normal-sized human hands, which forces painful decisions between whether you ought to keep a shard of glass for defence, or a blanket to fend off the elements. A bag, shoes, a roof over your head—these are as gold dust in the cold plains of future Earth, and if you survive long enough to find them, you've got a shot of unraveling the mystery behind the planet's devastated state. There's horror out there in them hills, from cannibals to killer robots. It's rather good so far.